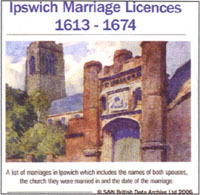 Another offering from S&N Genealogy Supplies, this is a digitally enhanced rendering of documents from the archives of the Archdeaconry of Suffolk, chronicling official marriage licences issued from Ipswich Probate Court in the 17th century. This is fully searchable through Adobe Acrobat with the ever-useful bookmarks and indexes - it's a mine of useful data for the genealogist tracing roots in East Anglia. S&N Genealogy Supplies, Manor Farm, Chilmark, Salisbury, SP3 5AF.